Amazon HQ2 in LIC? Yay or Nay? Re: Amazon HQ2 in LIC? Yay or Nay? Here's my fear. Now that Amazon as withdrawn what will happen to that site? Well, it will not sit idle. Developers will come in and build luxury hi-rise condos. The condos will be purchased by wealthy non-residents who will not pay city or state income taxes. New York City is becoming a vacation/tourist spot. We are not creating new jobs other than in the service/tourist industry. Amazon would have created good paying jobs that would have provided income tax revenue for the city and state. If we don't create good paying job in the city we will end up being a city where few people live but many people visit. The Amazon deal was far from perfect but we could have worked with them once they set up shop here. We could have encouraged them to invest in our city infrastructure (to improve the quality of life of their staff/employees.) And, BTW, not all the jobs would have been hi-tech. There would also have been a need for maintenance, security, custodial etc position. There could also have been partnering with our many colleges/universities. Anyway, it's done. And now we need to move on and figure out how to create more new jobs for our city's future. The Amazon deal was far from perfect but we could have worked with them once they set up shop here. Ask seattle how that went. There were a handful of articles that have come out in the last few days that help clarify the situation. I think politicians were hoping the company would make concessions for the neighborhood but, Amazon wanted to use hardball retaliatory tactics instead. The mayor was on the radio last Friday and my ears perked up when I heard him mention the company had reached a framework with the unions. I thought to myself, it is likely why someone decided to pull the plug. And finally, a dirtbag landlord PAID protestors to fake support for Amazon. At the protest, Musovic said that he'd spent $1 million renovating his Long Island City buildings in anticipation of the company's arrival. He previously told Bloomberg that he'd added new kitchens, flooring and other amenities to the apartments, with the expectation that he'd be able to hike rents by at least 25 percent. Several developers also said they'd bet big on the neighborhood, and many were devastated by Amazon's announcement last Thursday. Cuomo did not hold Amazon accountable to anyone in Queens. He was hoping for a LARGE photo op. City politicians were then having to clean up and press Amazon to make some agreements. The problem is, even if that happened, there is no way to account for the dirty tricks that people in real estate play and the inflated cost of living that would ensue before a shovel even goes into the ground. The Amazon issue isn't going away yet. As a matter of fact, things are getting ugly. 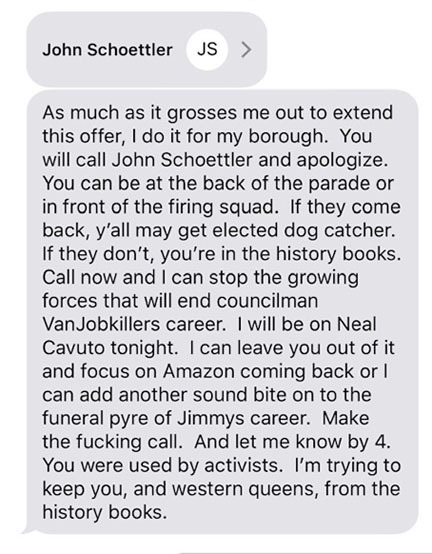 City Councilman Jimmy Van Bramer sent out a tweet stating that Josh Bowen, owner of John Brown Smokehouse in LIC, sent him a threatening text message. Apparently, Bowen wants Van Bramer to reach out to Amazon's Real Estate exec, John Schoettler, and extend an apology for protesting the Amazon deal. Look at this guy having to beg Amazon after what the Queens delegation did. So sad. Here's the rub: we needed AMZN more than it needs us. AMZN can set up HQ just about anywhere else. That's why they walked, cuz they really didn't have to put up with any BS. It illustrates the stranglehold big money and power has over us; fact is, if we want their money, we have to be seated at the same table. They don't have a stranglehold over us. They made an offer... and NewYork made an offer... and the deal fell through. It would have been great to get the jobs and investment in Queens but it isn't the end of the world. I'm sure NYC will survive just fine. LIC real estate was booming before Amazon, and will boom after. Hmmm. Perhaps the show might not quite be over yet. After all, in business, when negotiating, walking away from a deal is a well known and often effective tactic. That's true. And since there's no replacement on the horizon, you may be spot on.